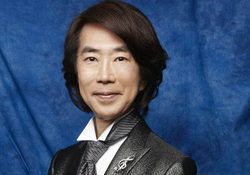 Toshiyuki Watanabe, born in Nagoya, Aichi on February 3, is a Japanese composer, arranger, record producer, and educator. In 2010, he became a professor of music and sound design at Senzoku Gakuen College of Music. In 1974, his band Akai-tori disbanded and he became a record producer. In 1979, he entered Berkley College of Music in Boston and studied composition and arrangement for classical music and jazz. Returning to Japan, he started his career in earnest as a composer for movies and TV while working with Masashi Sada as a record producer. He currently teaches composition and arrangement for pop songs and soundtracks as a project director. In recent years, he dealt with music for Japanese immortal masterpieces, such as year-long historical fiction drama series Mori Motonari and Toshiie to Matsu, TV drama series Nonchan no Yume, Karin, Dondo Hare, Ohisama, and more. His music has been used in animes such as Ginga Hyoruyuu Vaifam, The Irresponsible Captain Tylor, Space Brothers, and Ginga Kikoutai Majestic Prince.